Nicholas Ridley was born in Northumberland in 1503. He was chaplain to Henry VIII and Archbishop Thomas Cranmer. 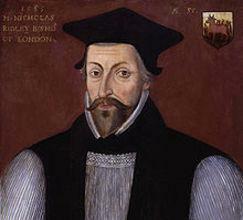 In 1547 he became Bishop of Rochester and in 1550 he was made Bishop of London. He was one of the first Protestant bishops in England and supported Henry VIII’s break from Rome. When Mary Tudor, who was a Catholic, became queen in 1553 he was imprisoned. He refused to give up his Protestant faith and in October 1555 he was burnt at the stake at Oxford with Bishop Hugh Latimer.